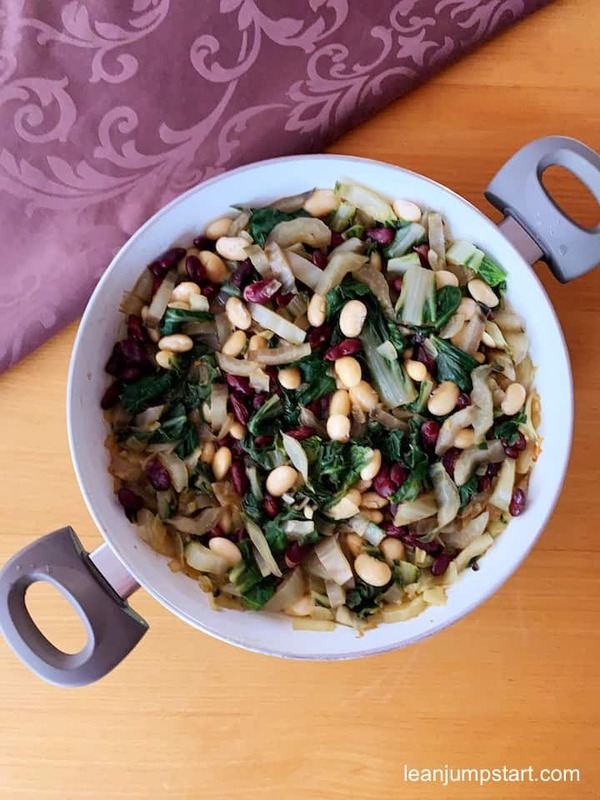 This sauteed Swiss chard recipe is for you if you are looking for a yummy way to add more cruciferous vegetables into your diet but don’t like the members of the cabbage family. 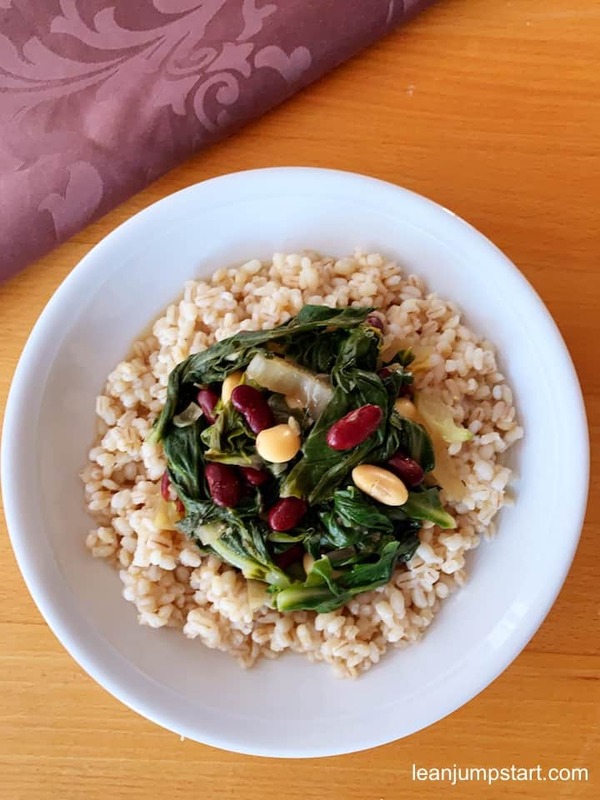 In my new blog post, I present to you a plant-based clean eating recipe that contains everything you need for a satisfying whole foods dish: Garlicky chard with legumes and grains like barley or brown rice. all in one simple dish. And not to forget the intense use of garlic with potent medicinal properties, giving this vegan recipe a wonderful garlicky taste. While I cook with spinach quite often I must admit that Swiss chard just doesn’t come to my mind naturally. Only when I get it in my vegetable subscription box (once in a while), I realize how much I’ve neglected this wonderful green leafy vegetable. And that is true, although my family loves Swiss chard. Probably it’s just a matter of habit and availability. Frozen spinach leaves I can get all year round at discounters like Aldi and even fresh spinach is something they offer quite often in the vegetable aisle. For Swiss chard, on the other hand, the demand seems to be not as high and you won’t get it easily. Sometimes my mother in law grows it in her garden and gets us some in the summertime. Chard vegetables come in all colors regarding stem (see picture at the end). And not to forget the “baby” Swiss chard. 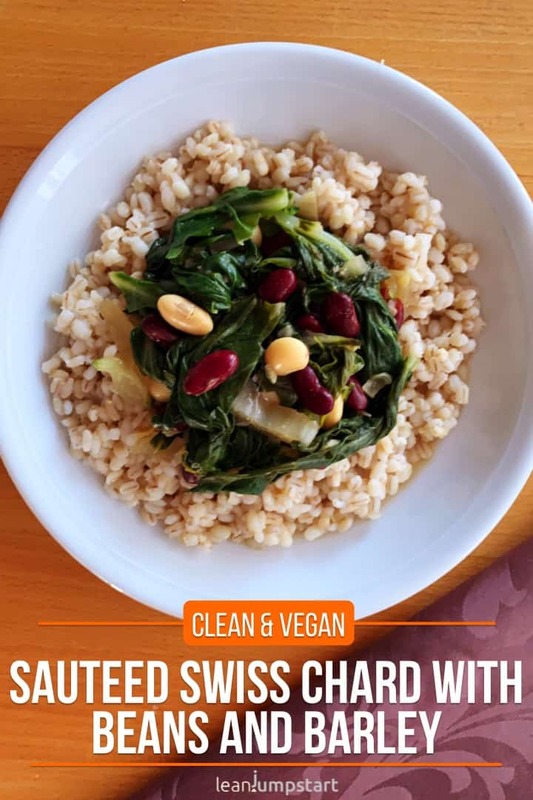 Baby red Swiss chard is my absolute favorite and I’ve also used it in this nutrient-dense recipe. The advantage of these baby veggies: They are milder in taste and you can use everything of the plant – no need to cut out center stems. On top of that it is quicker ready – in fact, it needs just a few minutes cooking to wilt. But as said, cooking a meal with Swiss chard as a base, is still a seldom exception. Nevertheless, this flavorful recipe is worth sharing with you. By the way, for a recipe with chard, you can always use (baby) spinach if you can’t get (baby) Swiss chard in your region. A delicious clean eating dish. In a large skillet heat 1 tablespoon of the olive oil over medium-high heat. Add garlic and the onions. Cook about 2 minutes, stirring occasionally, until they are softened. Add half of the chard and cook, 1 to 2 minutes. Add the remaining chard, when the first half has wilted. Add vegetable broth and coriander (optional) when all the chard is wilted. Add beans/chickpeas and cook until heated through 3 to 4 minutes. Drizzle the lemon juice over the mixture and season with salt and pepper, to taste. Serve it immediately on a base of cooked pearl barley, brown rice or other fiber-rich grains. Besides its distinctive taste, there are of course some more reasons why we should eat these leafy green vegetables more often. The anti-inflammatory chard helps the body manage blood sugar and is packed with vitamins (vitamins A, K, and C). Unsurprisingly it is the member of the same family as spinach. But did you know that the semi-grain quinoa belongs to the same family? It also contains 1.6 grams of fiber per 100 grams of chard. 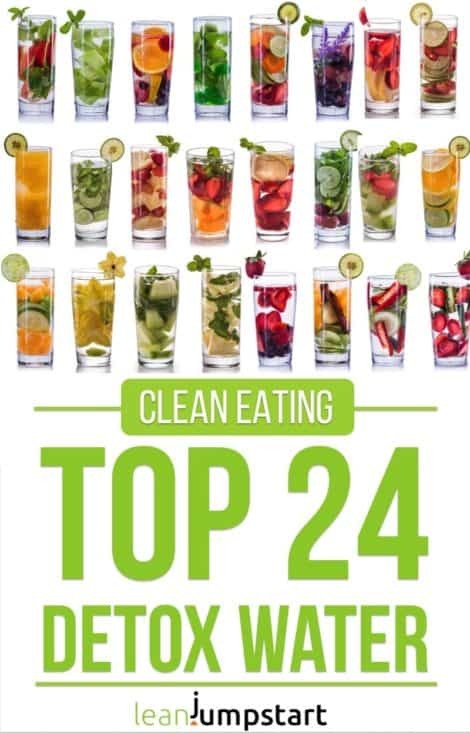 While these leafy greens don’t belong to the top 30 high-fiber vegetables, they still add to your overall consumption of the so beneficial roughage. Together with the fiber-rich beans and grains, you have overall again a fiber loaded meal at hand.